Polenta seems to be one of those things that people think is fancy or difficult or something, because as far as I can tell, people just don’t make it at home. It’s like it’s only consumed in restaurants as it’s just not one of those things people make in their own kitchen. I don’t know why though because it is so so sooo easy. Heat it, stir it, serve it. Bam. Delicious, satisfying, soul warming food. What people also don’t seem to know is that you can make it from fresh corn too. I actually prefer ‘fresh’ polenta vs. that made traditionally with dried corn. 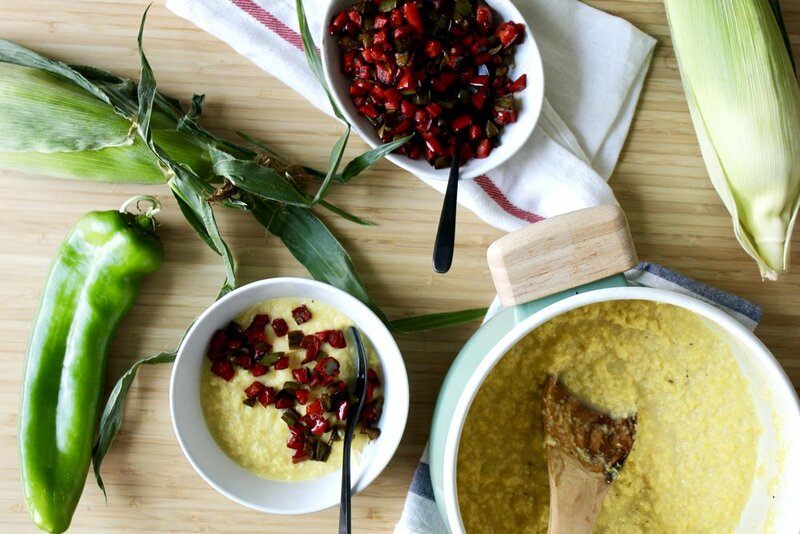 Fresh corn makes a much more flavorful, and unsurprisingly fresh-tasting polenta. Also, it seems to be better at holding moisture, as normal polenta can get dry pretty quickly, especially when reheating. 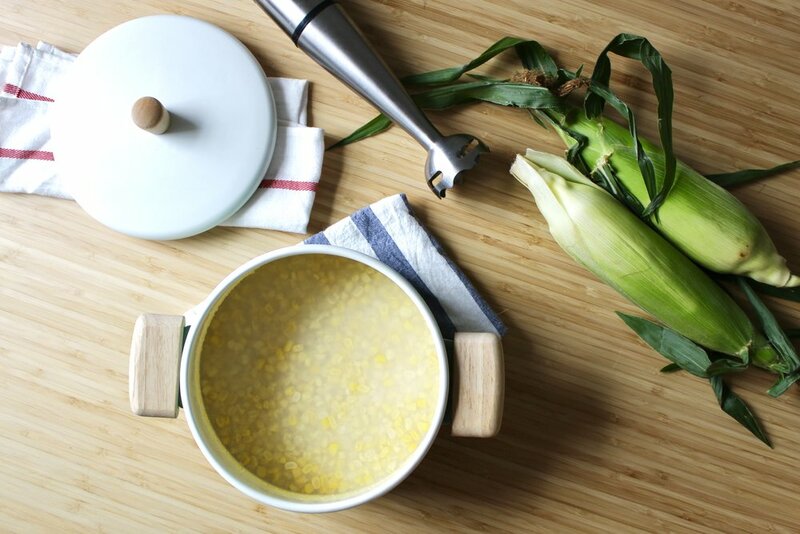 Making it with fresh corn is still super easy, and it’s pretty cool to transform whole ears of corn into a pot of spoonable amazingness. I recently moved to Colorado and have noticed people are quite fond of their chiles here. 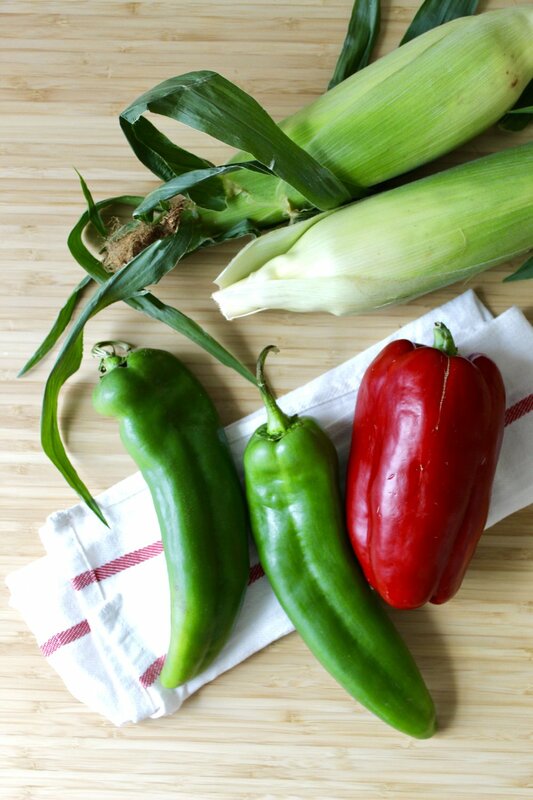 In particular, the favorite seems to be the Pueblo chile. It is a medium heat pepper with pretty thick flesh that makes it excellent for roasting. It’s also great balanced out with contrasting rich, salty cheese. 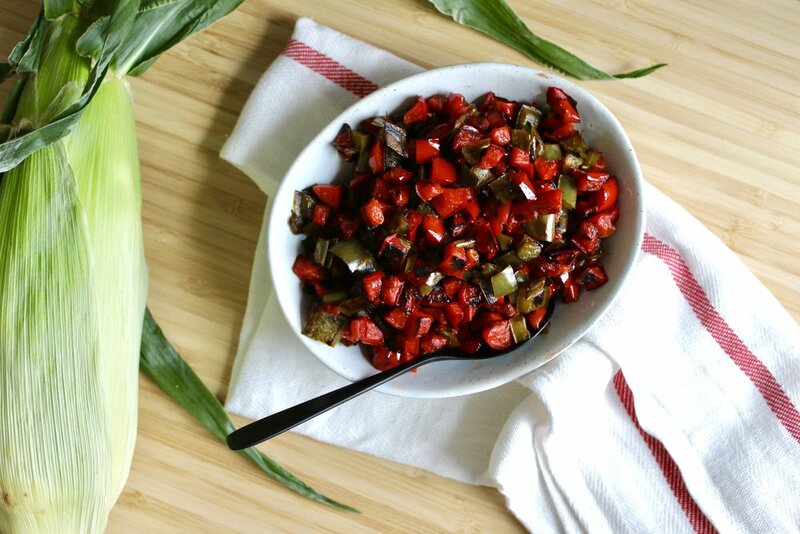 Chiles + cheese is a favorite and comforting classic combo in Mexico and this region of the US. This fresh polenta is such a lovely way to highlight that flavor friendship, as well as some very seasonal produce. If you don’t have access to Pueblo chiles, poblanos would make a decent substitute. Or, if you aren’t into capsaicin, you could just go for some sweet bell peppers. Try for a little spice though. It rounds out the other cheesy, corny, creamy, rich features of this dish. 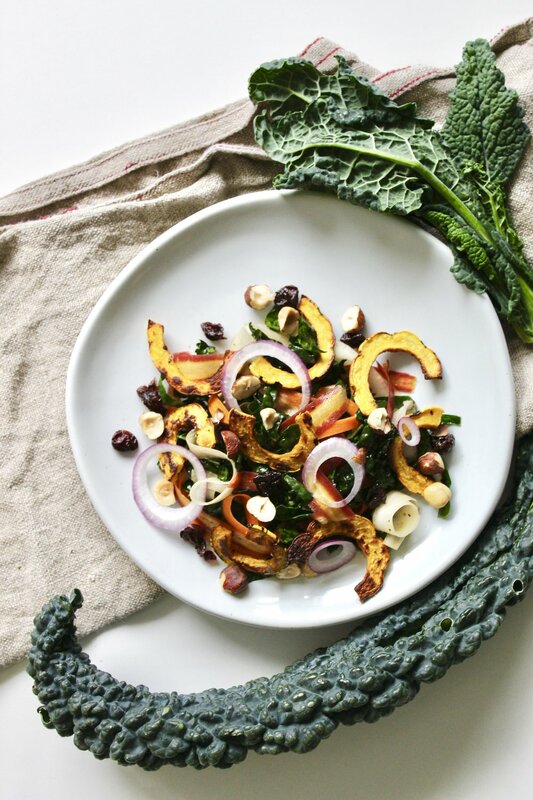 Serve alongside a grilled protein and fresh veggies, and you got yourself one super fresh, summery, and balanced meal. Husk the corn and remove as many of silks as you can. Put a small bowl upside down in a large bowl. 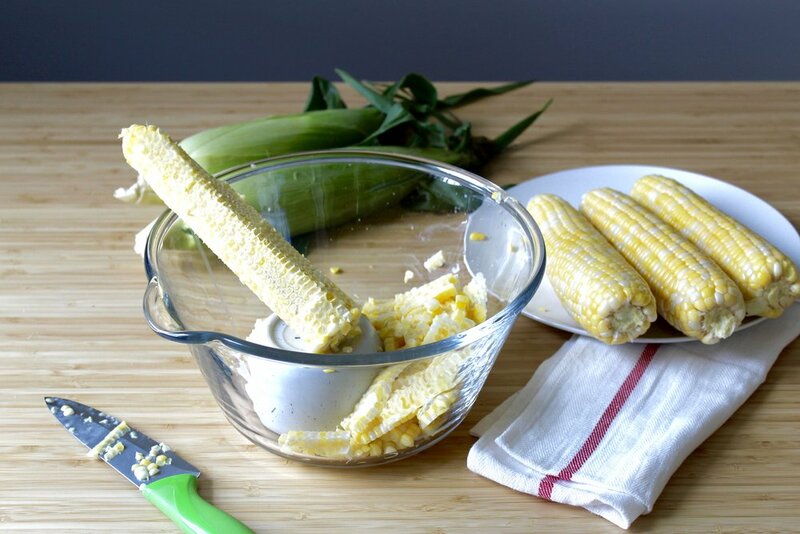 Stand up an ear of corn on the small bowl and cut down the sides to shave off the kernels. Cut all the way to the cob to get as much corn as you can. Repeat with all ears. In a medium pot, add the kernels with 2 cups water and the ½ tsp. salt. Cover, and place on high heat. When it comes to a boil, reduce heat to bring to a simmer and let cook covered for 10 minutes. Remove from heat and use an immersion/stick blender to blend the corn in the pot. (You could also ladle the soup into a blender to puree it. An immersion blender is an amazing, versatile tool to own, and I highly suggest getting one if you don’t have one yet) Blend until pretty smooth, but still with some chunks. Place back on the stove and bring back to a simmer. Cook, stirring every few minutes to prevent sticking to the bottom, for about 20 minutes, or until thickened. Careful! Hot polenta is angry polenta! (It will spit at you) How long you cook the polenta depends on how you like it. Cook longer and it will be drier, shorter and it will be more soupy. When done, turn off heat and stir in the cheddar and a few grinds black pepper. 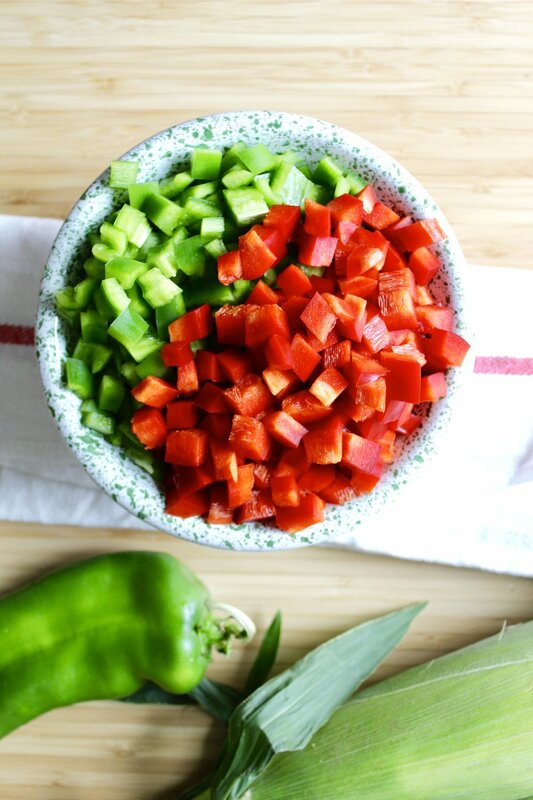 While the polenta is cooking, cut the peppers into small chunks. Heat a sauté pan on medium heat. When hot, add the 1 tsp. oil and the peppers. Season with salt and cumin if you have it on hand. Cook, moving occasionally, until peppers are very tender and are blistered. Serve polenta hot, topped with some of the peppers and a little more cheddar if you like. Extras can be stored for a few days in the fridge. Just reheat with a little liquid. Notes: You can really do as you please in terms of the peppers. If you don’t like spice, use two bell peppers. If you like things hot, use a couple chiles. If you like polenta a little creamier, stir in 2 tbs. cream or half and half with the cheese.